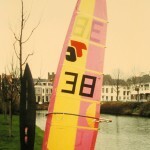 Before starting to develop the Thys 222 Rowingbike, Derk Thijs had a successful career in windsurfing (seven times world champion) and designing special surfboards. 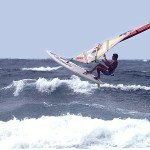 In his early windsurfing years Derk developed several new techniques. He was the first windsurfer to perform a waterstart during the world championships on Bendor in 1975. Pioneering on the field of technique and sport is the speciality of Derk Thijs. 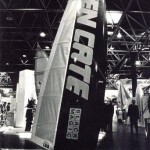 After he crushed the world sailing speed record for the first time ever with a windsurfing board in 1977 Derk already new the speed potential of the windsurfing board. This design, which is part of a legally registered document (January 1978), proves that Derk was the first man to build and sail (Christmas 1977) a sinker (a windsurfing board that has not got enough buoyancy to carry the sailors weight hydro-statically). It took several years before the rest of windsurfing world started building sinkers, in fact this started in Hawaii after Jaap van der Rest broke Derk’s world record on a small surfboard on Maui. 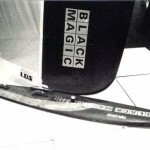 Guess where Derk’s old friend Jaap van der Rest got the idea for a small board from! 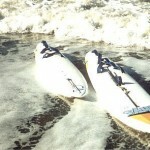 The skysurfer is a type of board that became popular in the last few years. Derk predicted the skysurfer on the same drawing sheet as the sinker, almost two decades ahead! Thys 290 and Thys 370. 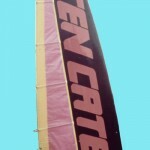 A ten Cate board in action. 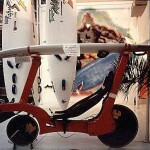 A recumbent for transporting a surfboard!